The American Academy of Political and Social Science (AAPSS) is pleased to announce environmental science, policy, and technology expert John P. Holdren as the winner of the 2018 Daniel Patrick Moynihan Prize. Each year, the Moynihan Prize is given to a leading policy-maker, social scientist, or public intellectual whose career demonstrates the value of using social science evidence to improve the human condition. 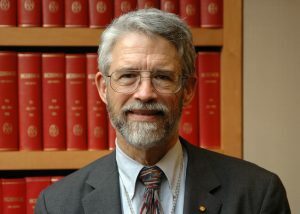 Dr. Holdren was trained as a plasma physicist, and his stellar, polymathematic career has been marked by his receipt of a MacArthur Prize Fellowship, his acceptance speech for the Nobel Peace Prize on behalf of the Pugwash Conference on Science and World Affairs (for which he served as Chair of the Executive Committee), and his appointment as Chair of the Committee on International Security and Arms Control of the National Academy of Sciences. He is perhaps best known for his eight years of service as President Obama’s Science Advisor and Director of the White House Office of Science and Technology Policy (OSTP), making him the longest-serving Science Advisor to a president in the history of the position. In a 2010 article published in AAPSS’s flagship journal The ANNALS, titled “Social Science Data and the Shaping of National Policy,” Holdren writes: “To make public policy on the basis of bad data or no data is almost always a serious error. … [R]esearch in the social sciences has been of demonstrable benefit to public policy in giving rise to a large array of explanatory concepts and analytic tools such as cost benefit analysis, the concept of risk aversion, the notion of unintended consequences, national accounts, randomized field trials for policy design, and so on.” In this same piece, Holdren advocates for the importance of and need for federal statistics and the need for the U.S. government to link survey and administrative data. In what is typically an opaque environment, Holdren has shone a light on the importance of data and research findings for more effective policy, something he has done throughout his career as an academic and a public official. In his time at OSTP, Holdren got “virtually all of the departments and agencies to produce for public review and comment, and then to finalize, policies on openness and on scientific integrity,” as he told Nature in late 2016. Holdren’s initiative led to great progress toward “open data”—the free availability of scientific data for analysis and publication—and toward the publication in open venues of federally funded research. Holdren is currently the the Teresa and John Heinz Professor of Environmental Policy at the Kennedy School of Government; Co-Director of the Program on Science, Technology, and Public Policy in the Kennedy School’s Belfer Center for Science and International Affairs; and Professor of Environmental Science and Policy in the Department of Earth and Planetary Sciences at Harvard University.